We’re proud to release the new Footnote.com. I am the senior user interface designer for Footnote and wanted to share with you ten things that you can do on Footnote with this release that you might not have considered. Look on the search results for annotations by members. For example this result shows that 2 annotations have been added to this document. Browsing for a document is fast and easy. Our browse page provides a powerful tool that lets you drill down to a specific document or search within a title. You can even bookmark where you have browsed to or send that link to a friend. For example, here is the browse page going straight to the Gettysburg Address. 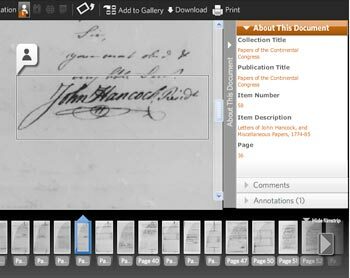 On any document you can annotate names, places, dates or text, which are then instantly searchable. This makes it easy for you to share your discoveries with the world. Upload any of your own documents or photos. Then you can annotate names, places, dates, or text, which are then instantly searchable also. For example this headstone that was uploaded by a footnote member. Try uploading one of your own. Have something interesting to say about a document you find or just want to add your two cents? You can leave comments on any document or photo. Write a page about any topic. People will be able to find these pages too. I have started a page containing all of the images I’ve found with John Hancock’s signature. Every member has a profile page that shows what they have written and how many annotations they have made—here’s mine. All-Access members can invite friends to view documents attached to your member pages Story Pages, and those friends won’t need to subscribe to see these documents. It makes it easier to collaborate and share ideas with them. Let people know that you are a Footnote Member and what you have been doing on Footnote. Include a Footnote member card on your website or blog that shows how many annotations you have made. I have included one on my personal website. Easily increase the type size on our site. We hope to make our site just a little more accessible for those that need the bigger type. Just go to your account and under Member Settings select “Change Font Size”. While there are other things you can do on Footnote I hope these whet your appetite for the time being. Rest assured, we are already working on adding some more fun and exciting things to Footnote. Remember, that we always appreciate your feedback on the website and that together we discover. Congratulations on he partnership! I’m interested in finding out more, however, my e-mail sent using the Footnote Web form bounced back. How can I get a hold of someone in your press office? Tried to download current version of Flash, and got a error that seems to say Macro Media Security Certificate expired Jan 12, 2007. If true, not real bright. Otherwise, look forward to seeing your site grow. I really think it’s a wonderful idea and will be an invaluable site for anyone, but the subscription fee is way too high. I’m currently investigating the issue with the Flash upgrade you’re having, and I’ll try to resolve it asap. Nice work. The site looks great: It’s intuitive and easy to use. Great job! Content looks interesting, but way too little given high fee. Why do you pretend that Footnote is a free service when there are actually fees involved??? Why would anyone add information and/or documents for the benefit of your company? Seems like a scam to me … nice web interface, though. I would like to see a free “trial” offered such as Ancestry.com & Genealogy.com offer. That way we can decide if it is worth our hard earned dollars. I hesitate to hand over that amount of money without knowing whether it is valuable to me or not. I agree it is quite a high price for the relatively limited content. A free trial would allow people to make an informed decision about whether this site will benefit their research. I think you would attract many more customers that way. We hoped that our Search Results would provide enough information to help people make an informed decision. In this case, we may have given too much away with the preview image. In other cases, if someone is not sure the document is what they want, they can buy just that image for $1.99 and skip a monthly or yearly commitment entirely. We’d be interested in learning more about what you would find helpful in making a more informed decision.